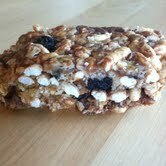 I am in the process of developing the perfect energy bar recipe for my boys. This is not an easy task. My standards: healthy, nutritious, yummy, and not too expensive But the most important factor~ they actually eat it. I found the website Enlightened Cooking and she is an expert when it comes to energy bars. I have taken parts of her recipe and created my first batch. This recipe is NO BAKE, a big plus for me. 1. 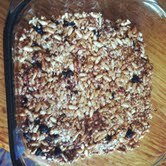 Combine oats, rice cereal, rice puffs, dried fruit, chopped chocolate/ nuts in a large bowl. I added the chocolate in at this stage because I want a more melted chocolate. 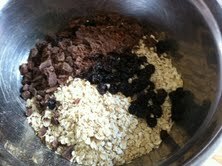 (If you want chocolate chunks then add it after you combine the dry ingredients with the nut butter/ syrup mixture. Let it cool 10 minutes and then add). 2. Combine the syrup and nut butter in a small saucepan over medium heat, stirring until melted and well-blended (alternatively microwave in small microwave-safe bowl 30-60 seconds until melted). Stir in vanilla until blended. 3. Pour nut butter mixture over cereal mixture, stirring until coated (use a wooden spoon at first, then get your hands in it. It will be sticky, but this way you can really coat everything). 4. Press mixture firmly into an 8-inch square pan (sprayed with nonstick cooking spray) using a large square of wax paper (really tamp it down). Cool in pan on a wire rack and chill at least 30 minutes to help it set. Cut into 12 bars. (Wrap bars tightly in plastic wrap and store in the refrigerator). Enjoy! The boys like them so far. I think the next time I make them I will skip the puffs all together. The rice crisp cereal is the right texture. Hi, thks for sharing. i would like to make these bars for my sons who are very active in school and sports. however i cant seem to find brown rice syrup. can i know what else can i use. Have you ever considered ordering it online? That may be an option, or you may try honey as a replacement. « Flu. Fever. Grief. Food Poisoning. Teething. Colds.